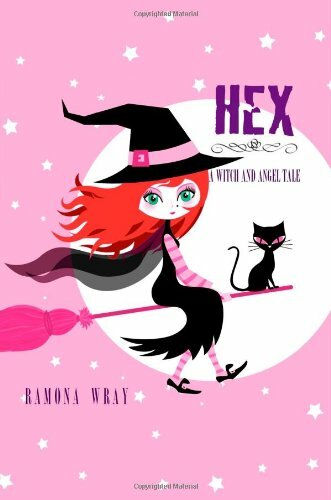 When I first saw the title Hex, A Witch and Angel Tale, I wondered how you could do a story combining witches and angels without making it ridiculous. Fortunately, Ramona Wray pulls it off. Hex is a delightful tale of romance, adventure, friends, family, and betrayal. Hex is like no angel or witch story you've ever read. The witchcraft element has a more Wicca, naturalistic bent to it than Harry Potter. Lily concocts potions and candles with healing powers. Lily has the ability to read people from a single touch. It's more of a curse, really, since it keeps her separated from everyone around her. Otherwise, she's a normal girl. The angels come in later. They're not as angelic as you might expect. Wray marvelously combines witchcraft and angel mythology. The origins of both are intricately connected. The story takes you through time as you see how angels and witches originated, coincided, and eventually collided to create the tragic story of love and betrayal that is Hex. The mythology unravels throughout the story at the perfect speed. I didn't have to sit through half the book wondering what the paranormal element was and I also didn't get bombarded with world-building information in a single chapter. At first I worried that Hex would be just a stereotypical YA romance where the characters fall in love at first sight and the poor girl has to choose between two fabulous guys who adore her. There are elements of that in Hex, but with just enough of a twist to keep things interesting. Ryder and Lucian both fall hard for Lily (or appear to do so). Lily is instantly, supernaturally attracted to Ryder, while being intrigued and disturbed by Lucian. Ryder was a great character. It's true that their romance has an otherworldly element, but we also see Ryder's kindness, humor, and intelligence - you understand why Lily falls for him. Lucian was also fascinating. Cunning, protective, and preppy handsome. The relationship between Lily, Ryder, and Lucian wasn't just a triangle. It wasn't necessarily about Lily choosing between two good options. No...one is right and one is wrong. But Lily doesn't know that. I didn't know who was best either. Just when I thought I was sure, Ramona twisted the story around so far that my mind was in a tailspin, and I was turning the pages to find out what would happen. The book is told from Lily's perspective. This is important, because her voice and thoughts are as much a character in this novel as the Lily, Ryder, and Lucian that we see through her eyes. She never lacks for words. Perhaps because she's always been an outsider, she keenly observes the world around her and always has some witty commentary running through her head. This is both the highlight and the main downfall of Hex. I loved Lily's voice. She had a wry sense of humor. Even in very serious moments, her insights made me smile. She wasn't inappropriately funny - just had an interesting way of thinking. At the same time, her voice really slowed down the book. If a scene could be described in one sentence, Lily inevitably used at least five. Also, a few (and it really was just a few) of her witticisms didn't sound right coming from a teenage girl. For example, she once referred to Hillary Clinton's claim in the 2008 presidential campaign that she landed in Bosnia under sniper fire. It made sense in the context of the novel and it was kind of funny, but I doubt most teens would get the reference or care. Overall, I enjoyed living in Lily's world. As long as you have patience with a sometimes slower than necessary narration and take the time to let Lily's quips sink in, Hex is an amusing and insightful novel. On a side note, don't be scared away by the fact that Hex was self-published. Apart from the wordiness, which as I mentioned both helps and hinders the book, the writing is perfect. I didn't catch any spelling or grammatical errors. The plot was clean and complete. The writing is even more impressive, because Ramona is not a native English speaker. She did a great job capturing colloquialisms and the teenager voice. I recommend Hex for an interesting twist on the paranormal genre. The mythology is well-developed, well-conveyed, and truly fascinating. The characters and romance may not break new ground, but Lily, Ryder, and Lucian were fun people to spend a few days with and the romance was sweet, tragic, and passionate. Perfect for the reader who's tired of reading simple angel, fairy, vampire, werewolf, or witch novels. Wow, this one sounds so good! I don't think I've read a less than fabulous review for it yet! I'm so glad you think the love triangle element is done well, I never mind them when they seem plausible and the characters are all engaging enough to keep things interesting:) Fantastic review Alison! I have seen this book around and it caught my eye. Great review. It sounds like a great book. I will pick this one up!